How is our taste affected by our gender and age? As early as age two, most of us would have developed the ability to taste. As we get older, flavours become more familiar to us, and we grow more confident in our ability to discern different flavours. To best illustrate how flavours are formed, imagine two contrasting tastes such as sweetness and bitterness. When we think about these flavours, we know immediately what each tastes like. But how? Through memory, certainly. But when tasting in real time, flavours are actually a combination of what we smell in the nose, taste on the tongue and feel in the mouth. Subsequently, Sensory Researchers draw hypotheses based on the patterns observed. The more they learn and discover from the customers, the more doubtful they are of whether what they are personally experiencing is even real. The ability to taste is highly dependent on the taste buds, which are raw sensors in our body that detect taste. These are vulnerable to a number of things, for example, age and gender. Age has a huge effect on our sense of hearing, sight, smell and taste - these senses tend to degrade as a person ages. In terms of gender, women (as child bearers) are genetically more sensitive to flavours and possess a better sense of taste compared to men. This is an evolutionary requirement because poisonous, harmful compounds are often sour or bitter. When we examine the balance and nature of flavours, we can observe a phenomenon similar to an optical illusion – it’s all relative. Although something may be both sweet and bitter, when we taste more sweetness than bitterness, our perception of taste swings more towards the sweetness; with bitterness disappearing significantly. An example of this phenomenon in action is when someone adds sugar to a cup of bad bitter coffee to take away the bitterness and improve the taste. Choosing a cup of good coffee often means paying more for it. But it also means a better tasting cup of coffee, without the need to add sugar. The fact is, aromas are capable of suppressing taste. Sometimes, our sense of smell can lead to a false perception on whether something is sweet or bitter. In truth, sweet and bitter tastes can only be detected via our tongue and mouth area. An example of how this works is when you smell a rose and think it is sweet, without actually eating/tasting it. Similarly, if you encounter the aroma of strawberry or vanilla in a beverage, it could make you think that something is sweet, even when it isn’t. If after that, you use your tongue to taste it, it may even taste sweeter than it actually is. This increased intensity of sweetness arises from your initial perception. In other words, the actual level of sweetness in the beverage has not changed; however your perception of its intensity has been altered by smell. 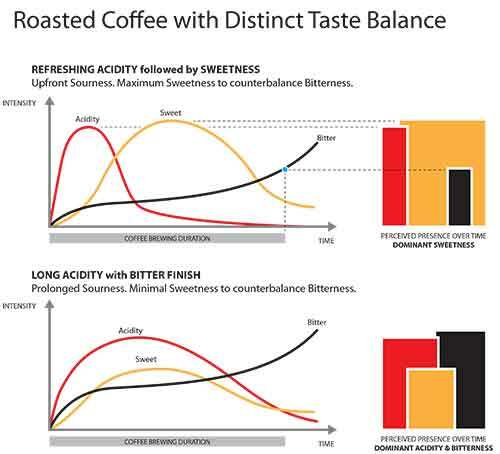 So you can see how aromatics can be used to influence taste in coffee. When we experience a particular flavour or taste on a regular basis, the human mind becomes more accustomed to those notes. So if you consume bitter things daily, bitterness becomes more tolerable. 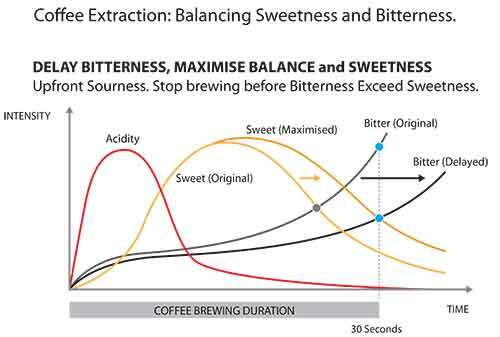 In the case of speciality coffee, acidity and sourness are persistent in lighter roasted coffee. When speciality coffee baristas consume their “speciality grade” coffee, their brain becomes more accustomed to and more acceptable of higher levels of sourness. On the other hand, commercial coffees tend to be more bitter. Commercial coffee baristas tend to be more tolerable to bitterness. This is a phenomenon known as Cognitive Ease. When commercial coffee baristas or consumers move into the speciality segment, their first complaint will generally be that the coffee is too acidic or too sour. This phenomenon is recognised as Cognitive Strain - a sudden shift in sensory experience that can generate alarms in the neural circuitry. So with all these factors at play, one can never be sure of what one is experiencing, or what reality is when it comes to coffee tasting. Teenagers, seniors, men and women all experience flavours differently. We can’t swap our noses, tongues or mouths with others; so we can only embrace our own unique experiences. As professionals in our field, we need to study and understand that good flavours aren’t a single point on the scoreboard, but in fact encompass a rich gamut of areas. It’s important therefore to take a step back, not take ourselves too seriously, and maintain a sense of empathy. Take time to appreciate what the customers may be experiencing and strive to serve them well.